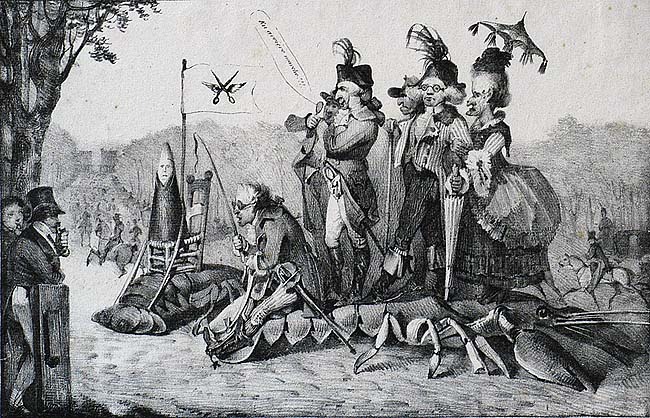 Stendahl on "the empire of ridicule"
"Voilà le sens dans lequel moi, poète comique, je dois travailler pour être utile à la nation, en détruisant la prise des tyrans sur elle, et la rapprochant par-delà de la divina libertà." [This is the direction in which I, as a comic poet, must work in order to be useful to the nation, by annihiliating the power of the tyrants over her, and hence bringing her to the divina libertà. 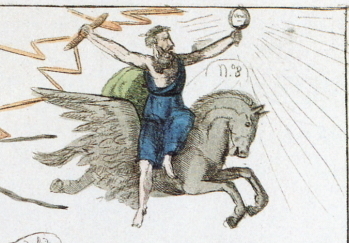 (Stendhal, Pensées, 12 August 1804). 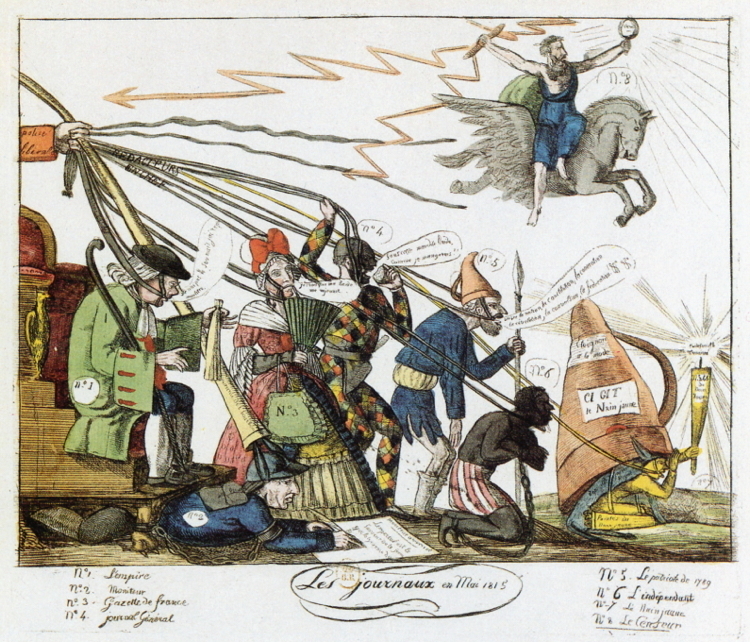 These two details from anti-censorship caricatures from 1814-15 show how the opposition liberal press reacted to the crackdown on press freedom by the restored French monarchy. 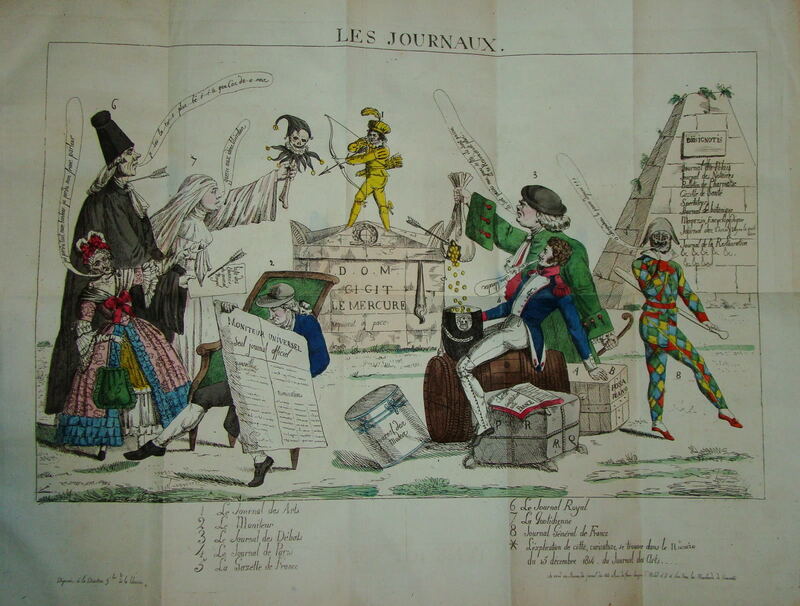 On the left we see a figure representing the liberal journal Le Censeur edited by Charles Comte and Charles Dunoyer. They have broken free of the muzzle and reins of the government censors and continue to hurl lightning bolts and shine the light of criticism on the regime. On the right we see an archer dressed in yellow depicting the liberal satirical journal Le Nain jaune (the yellow dwarf) who fires his critical arrows at representatives of the old order - the chruch, the aristocracy, and the monarchy. 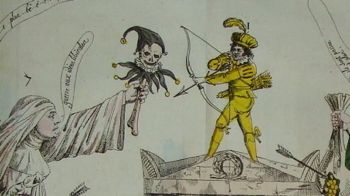 The nun representing the pro-church press holds a death's head doll and her speech bubble says "guerres aux idées libérales" (war against liberal ideas). 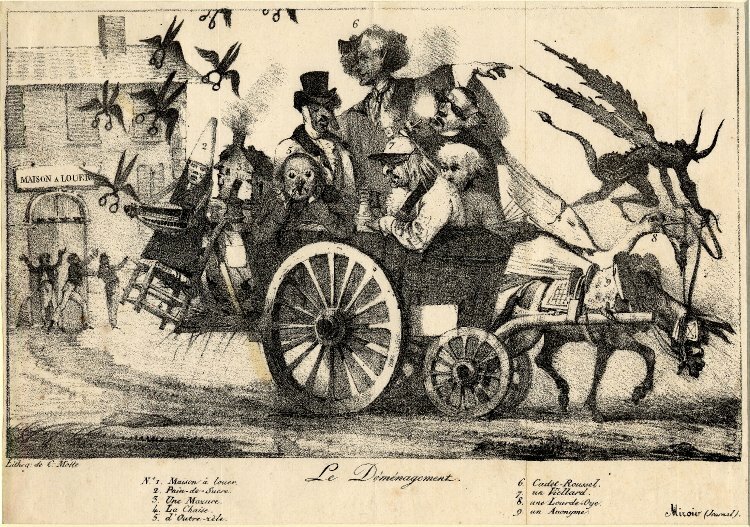 Historical Background: An important source of information on Delacroix's caricatures in the Restoration period is Nina Maria Athanassoglou-Kallmyer, Eugène Delacroix: Prints, Politics and Satire 1814-1822 (New Haven: Yale University press, 1991). 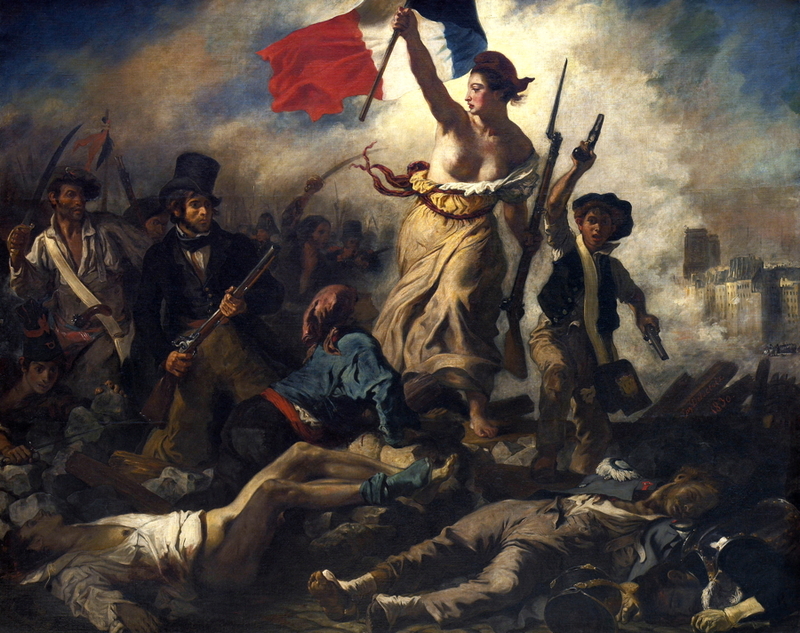 Description: We conclude with Delacroix's most famous political painting "Liberty leading the People on the Barricade" which he painted to celebrate the victory of Louis Philippe's rise to power as the July Monarch in the Revolution of 1830. The hope was that a more liberal constitutional monarch would finally put an end to the political repression and censorship of the restored Bourbon monarchs whose reign had turned particualrly sour under Charles X. This painting deserves separate treatment because of its richness and its political symboism which we will leave to another time. 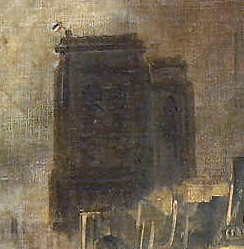 We will however note that in this high resolution image we can see the revolutionary tricolour flag flying from the roof top of Notre Dame cathedral in the distant right of the picture (a detail from which is shown below).